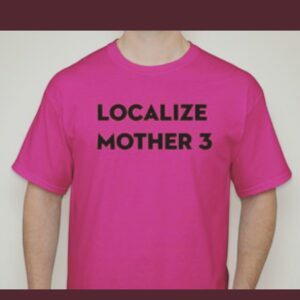 You’ve seen it at your favorite wresting shows and political events, now the incredible message of the LOCALIZE MOTHER 3 sign has been captured in t shirt form! Wear your passion across your heart and other vital internal organs with this 100% cotton unisex t shirt. We’ve selected a special blend that gets softer each time you wash it, ensuring that you can wear it in maximum comfort for years, which seems likely considering the obstinate attitude of one certain Japanese video game company. Send a message to your friends, peers, some guy named Reggie, and a gleaming office tower in Kyoto with this stylish and provocative objet d’art.